Cancer cells that develop resistance to drugs pay a price for this by simultaneously developing a new vulnerability. If this acquired vulnerability can be identified, it may be exploited clinically. A team of cancer researchers, led by Rene Bernards of the Netherlands Cancer Institute and Oncode Institute, have now exposed this acquired vulnerability in melanoma that has developed resistance to a targeted therapy with BRAF inhibitors. The team then developed a new therapeutic strategy to selectively kill the drug-resistant cancer cells. Professor Bernards says, "Drug resistance seems inevitable because tumours are constantly adapting. For over 40 years, we have been devising ways to prevent drug resistance in cancer. Now, I think, let's just accept that this is the way it is, and go and see if we can find the new vulnerability associated with resistance. Then we can exploit this sensitivity clinically and keep the cancer under control for a longer time." Bernards and his team were able to expose this new vulnerability in melanoma that has developed resistance to treatment with a BRAF inhibitor—a targeted therapy that blocks a signalling pathway in the cancer cell through which it gets the message to keep on dividing. This is due to a mutation in the BRAF gene, which plays an important role in cell division in healthy cells. More than half of all melanoma patients have a mutation in this BRAF gene. For these people, the BRAF inhibitor does its job and tumour growth stops. But within a few months, the tumour cell adapts, the original signaling pathway becomes active again, and even hyperactive, and it starts growing again. The key question is what price melanoma pays for resistance. 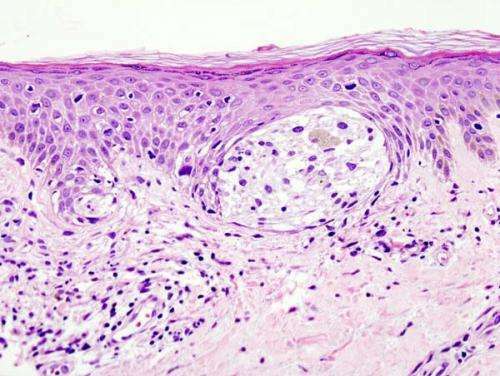 In the lab, the researchers made melanoma cells resistant to the BRAF inhibitor and saw that the hyperactive resistant melanoma cells produced large amounts of reactive oxygen species. Cancer cells that were still sensitive to the drug did not do this. Reactive oxygen species are a double-edged sword in both healthy cells and in cancer cells. They play an important role in transmitting signals in the cell, but if their concentration becomes too high, they cause DNA damage and the cell may stop dividing. Also, in the Bernards experiment, the abundance of free radicals caused the resistant melanoma cells to stop dividing. However: they did not die. Bernards says, "Then we thought, suppose we can give those hyperactive resistant tumour cells the last push toward cell death by allowing them to produce even more free radicals." In the lab, this worked perfectly by exposing the cells to a substance that stimulates the production of free oxygen radicals. Only the resistant tumour cells died; tumour cells that were still sensitive to the original drug remained alive. But does this also work in a living organism with melanoma? Bernards tested this on mice with an existing drug, vorinostat, which is known to stimulate the production of free oxygen radicals. Vorinostat has been used in the clinic for 15 years, including for a rare form of lymphoma, and is not very harmful to the patient. In mouse models, the researchers did, indeed, see tumours shrink under the influence of vorinostat. Because it was an approved and safe medicine, Bernards could then quickly start a clinical proof-of-concept trial among a very small number of patients of the Netherlands Cancer Institute, together with physician Jan Schellens and hospital pharmacist Jos Beijnen. The concept also appeared to work in patients. This laid the foundation for a new therapeutic strategy. Step one: Treat patients with BRAF-mutated melanoma, as usual, with signal pathway inhibitors. Step two: When the tumour has become resistant, stop giving those inhibitors and immediately treat the patients with vorinostat to kill the resistant cancer cells: a 'one-two punch' approach. A hit from the left, immediately followed by one from the right. "It is not a combination drug," emphasizes Bernards, who has made a name for himself with smart combinations of drugs. "It is very important that you first stop the signalling pathway inhibitors, because they suppress the free radicals and thus eliminate the effects of vorinostat." Bernards is happy with his scientific research, which resulted in a well-founded new strategy to treat melanoma that has become resistant. But he is at least as happy with the speed with which a lab study resulted in a clinical trial. "It is unique that a clinical trial has already been part of a fundamental scientific publication. This is how we increasingly want to do it." And moreover, Vorinostat is a notoriously expensive drug, but hospital pharmacist Beijnen can make it himself in the pharmacy of the Netherlands Cancer Institute. This is permitted for a clinical trial, and there is also no longer a patent on the American medicine. Bernards says, "That is why this research fits so well with the new Oncode Institute, whose mission it is to bring new treatments to the patient quickly and cheaply." Given that cancer evolution is a diversifying process with increased number of moving (and unpredictable) targets, it is hoped that one particular selection factor such as the application of anti-cancer drugs will force different cancer lineages to evolve through a predictable pathway of drug resistance. Thus, in the presence of anti-cancer drugs, all different cancer cell lineages will share this hopefully unique and identifiable drug-resistance mechanism which can then be targeted. This seems to be an excellent idea, but I am not sure if this paper presents a compelling case demonstrating that different cancer cell lineages will evolve to acquire the same drug-resistance mechanism in the presence of anti-cancer drugs. The mechanisms of drug resistance in the preclinical experiments and in the clinical trial are different. They are forced together. Clinical data of the three patients demonstrated the idea of drug-switching should not be used in the clinic. All patients progressed...How was the main conclusion supported by the data? Maybe the lowered frequency of Nras mutation after treatment. Tumors are heterogeneous. It is not clear to me how the same piece of tumor got sampled twice from a patient? Did I miss anything?